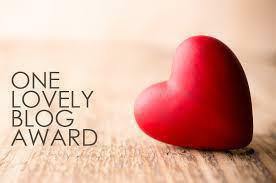 Like the lovely Melinda Tognini, whose erudite thoughts you can read at Treefall Writing and who kindly nominated me, I have decided to gratefully accept and participate in the “One Lovely Blog Award” because I like the idea of supporting other bloggers. I’ve seen a similar scheme badged under “The Versatile Blogger Award” and I’m sure there are others. Of these “awards” what I have enjoyed is seeing blogger’s recommendations of other blogs that I may not have otherwise found, many of which I have ended up following. nominate other blogs for the award and let them know. Living the first five and a half years of my life in Kalgoorlie has conditioned me to hate going outside with bare feet – the ground was often blisteringly hot and not infrequently full of nasty prickles. I howled in confused terror the first time I saw rain – I was born during a drought and didn’t experience rain until we travelled to London to visit my grandparents when I was aged 2 ½ years. Paradoxically I am always comforted to hear rain on the roof now. I also vividly remember screaming at the colour TV when Playschool featured a tractor driving towards the camera that same holiday – I thought it was going to drive out of the screen. There was no television broadcast in Kalgoorlie so it was all new to me (indeed when TV came to Kal a couple of years later it was only in black & white). I adore silence when I’m alone – so good for the soul just to be rather than fill the void of an empty house with TV or radio. I am not sure if my love of dragonflies came from my love of art nouveau or if I was drawn initially to art nouveau because of all the dragonflies. One of the many things I love about Australia is the multicultural cuisine – yum! The palate has no excuse to be bored in this country. I have more grey hair in the latter half of my forties than my mother does in her seventies. And the nominees are … a mixture of new and not-so-new bloggers. I will not be at all offended if those I nominate prefer not to accept the award. This is about sharing blogs I enjoy, not obligating anyone! My rationale is that to support emerging bloggers, established bloggers who post GREAT content should also be eligible. I think you’ll see my bent for writing, creativity and health with the huge overlap noted. Elizabeth Spann Craig – great posts and a weekly list of twitterific links which are fab too. Joanna Penn at The Creative Penn and Molly Greene – both share all manner of wonderful insider knowledge about writing and publishing. Write to Done claims “Unmissable articles on writing” – close to the mark. Writer Unboxed – varied and helpful posts and I highly recommend the WU Facebook group too. If Melinda Tognini hadn’t nominated me first I’d most definitely have nominated her – Treefall Writing is newer but clearly one to follow! Because authenticity and creativity go hand in hand I have categorised Dionne Lew’s Be Your Whole Self here … but this blog truly has so much more! Fellow GP, Dr Edwin Kruys at Doctor’s Bag taught me heaps about how doctors can blog, especially the older posts on his Social Media tab. For Australian GPs: FOAM4GP – A fabulous free quality online medical education blog. Mother, doctor and writer, Louise Allan on “Life from the Attic” – heartfelt posts and spot-on book reviews. Laura Zera mostly on travel and mental health, a blog I keep coming back to. Dionne Lew – Yup, a second nomination for Dionne but a very different and useful blog. At first I thought I’d struggle to think of 15, then found myself struggling to keep the list to 15. Apologies to those who didn’t make the short-list. What are your thoughts on awards like these? What great blogs have I missed? I’d love to hear about blogs that you’d suggest are worth a visit – please share them in the comments. Thanks so much for including me in your list, Jacquie. I’m very honoured, and as Laura says, some great company to be in! Thanks Belinda for being such a fabulous and friendly guide! Love the liberation of throwing off the shackles of hair colour and the compliments the new look has earned you! It really is an exposé on what we do to (try to) look good and what it costs us. Actually we didn’t get onto cost but wow all that hair colouring can add up! Looking forward to the continued pleasure of opening my emails to see a post from you! Congratulations Jacquie! And thanks for all the wonderful blog recommendations. I’m eager to check some of them out =). Thanks Cas – I do hope you find some of them useful! Happy writing. Thank you Jacquie! That’s really lovely. All thanks to you – I find your updates so valuable Natasha! I am constantly inspired by how much support there is for writers online, and you make a huge contribution in that space.